The new Surface Book 2 runs professional-grade software with high-speed Intel processors, lightning-fast storage, and delivers up to 17 hours of battery life. Introducing the new Surface Book 2. 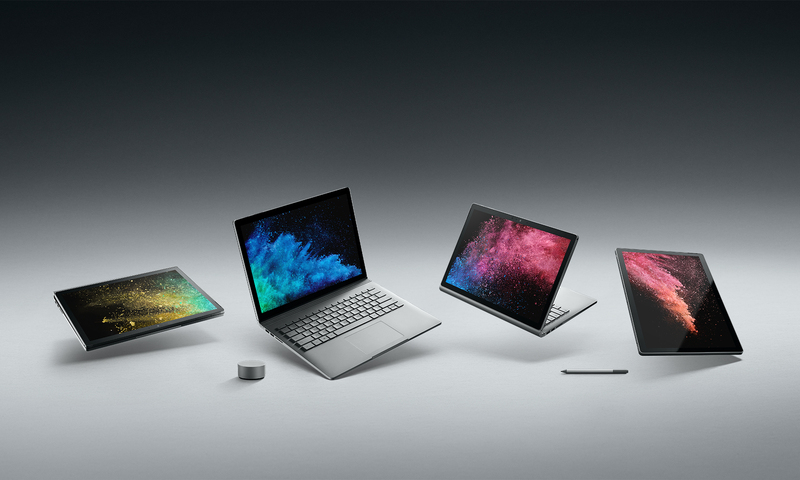 Get powerhouse performance and amazing graphics with the new Surface Book 2, a robust laptop, tablet, and portable studio in one with up to 17 hours of battery life1 and 2 times more power than before. Now available with a stunning 13.5” or 15” PixelSense™ Display, designed for Pen and touch. Detach the stunning PixelSenseTM Display to transform Surface Book 2 into a thin and powerful quad-core Intel®Core™ i7 tablet you can take anywhere. Fold Surface Book 2 into Studio Mode to draw and sketch in a comfortable, natural position. Add Surface Dial,* Pen* and touch for an immersive creative experience. Detach the screen with the push of a button, turn it around, and reattach to share content and presentations. Interact with Cortana7 using only voice commands. Perfect for watching a movie or playing your favorite games.